With a range of colour options, our acrylic hard court surfaces from Rebound Ace and Plexipave are ideal for basketball, tennis, netball, multi sport courts and athletics tracks. Scroll down to see information on the option to add cushioning within the surface for the ultimate in player/athlete comfort and performance. If you have an indoor complex please click on the Impact Indoor tab. Impact Indoor is perfect for your indoor complex. 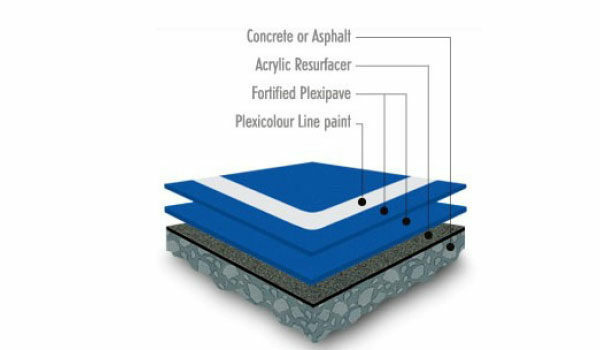 Plexipave provides a high-performance surface for tennis, track, basketball and netball. 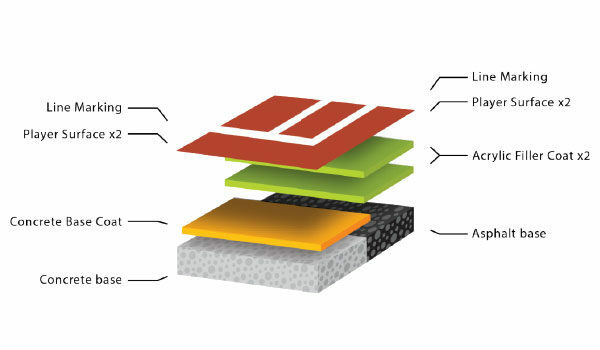 The surface is designed to provide players with the highest levels of surface performance for competition. The Plexipave Color Finish system is an all-weather, durable quick-drying colour surface that provides superior resistance to deterioration from ultraviolet rays. 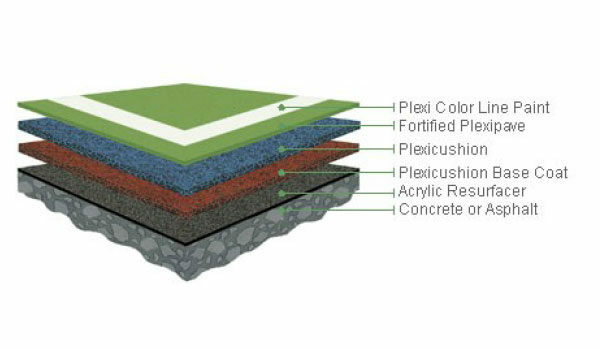 Plexipave is a 100% acrylic latex colour intense sports surface formulated for use over asphalt and concrete. 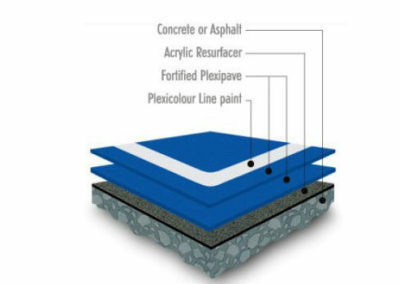 Plexipave is the surface used in the Australian Open tennis tournament. 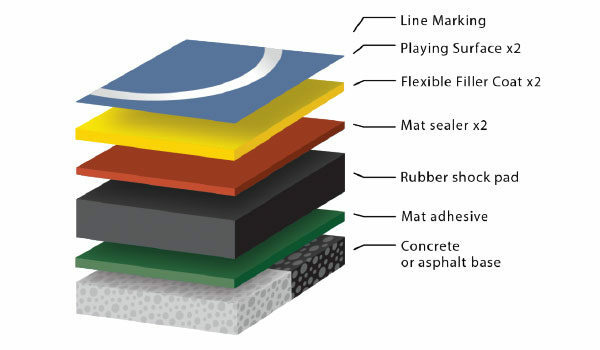 Synpave Rebound Ace Sports is a high performance sports surface solution for tennis, netball, basketball and multi sport courts, among others - anywhere court type ball sports are played. The Synpave acrylic topcoat offers 12 modern colours specially formulated for use in active sports. All 12 colours impress with their vivid hues, provide excellent reflectance and boast ultraviolet light stability that was originally formulated to withstand the Australian sun, whilst providing excellent slip resistance and durability. Rebound Ace Sports HSA provides the perfect combination of performance and comfort with high shock absorption designed for health, wellbeing and comfort of all players. 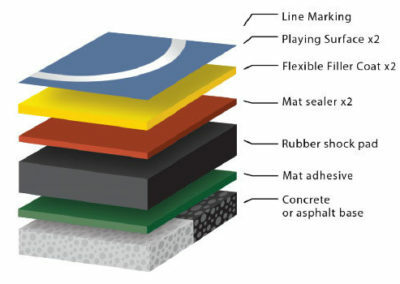 Using a 4 mm rubber mat, HSA is the perfect surface solution for competitive play and physical wellness. HSA is topped with Rebound Ace Sports Ultra top coat which offers 12 of the most vibrantly pigmented colours in the industry. Rebound Ace have designed outdoor and indoor versions that offer affordable genuine cushioned courts using the proven superior polyurethane / rubber mat technology for clubs, educational facilities, resorts and private courts. Rebound Ace Sports HSA places long life player comfort and ITS rated playing properties at an affordable price. 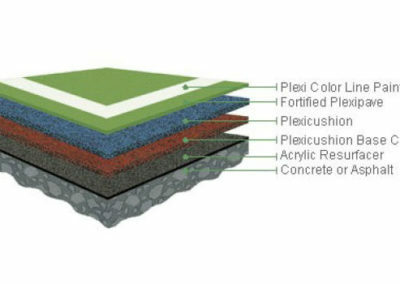 The Plexicushion System combines the consistent bounce, sure footing, and outstanding durability of Plexipave with the innovative shock-absorbing properties of EPDM Rubber cushioning. The Plexicushion substrate, a special blend of latex, rubber and plastic particles, forms a resilient layer that absorbs body shock and reduces muscle fatigue. 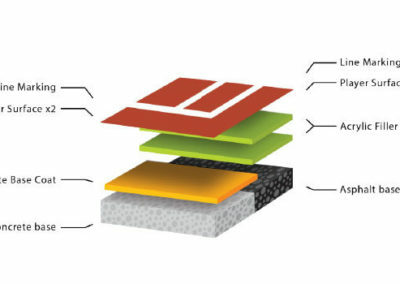 The 100% acrylic Plexipave Surface provides consistent and uniform bounce, long lasting colour, and allows speed of play specification.